Find fun things for groups to do in Chicago this fall with these music festival, cultural events and more. Have a group visiting Chicago during the fall? There&apos;s no shortage of fun things to do, especially with this packed lineup of large-scale festivals and special events in Chicago on the calendar. From cultural celebrations and fine art productions to music festivals and special anniversary seasons, this is the hit list. As the largest free festival of its kind in the world, expect hundreds of thousands of attendees flocking to Millennium Park to watch top-name jazz performers as they take the stage in Jay Pritzker Pavilion. Get ready to toast to the 33rd anniversary of this free annual event — Chicago&apos;s largest and longest-running Oktoberfest party — which includes live music and classic Berghoff German dishes, such as bratwurst and Bavarian soft pretzels. N. Western Ave. and N. Lincoln Ave. This annual event celebrates all things German. Traditional interactive cultural programs, music, dancing and, of course, great food and beverages are available at this three-day festival in the Lincoln Square neighborhood. Showcasing international musicians at venues throughout the city, the 19th Annual World Music Festival Chicago celebrates diverse music from around the world with free musical performances at Jay Pritzker Pavilion and an array of cultural performances, such as contemporary Moroccan music in the Gnawa tradition and Southern Slavic folk played by a tamburitza band. Navy Pier&apos;s Festival Hall will be bursting with creative energy, as 140 prominent international galleries from 16 countries and 45 cities will present thought-provoking artwork, while expert panels, a lecture series, site-specific installations and a selection of forward-thinking film, video and new media works will give attendees plenty to see, do and think about during this four-day event. Over 100 participating architects and artists based in more than 25 countries will converge for this free event showcasing exhibitions, large-scale installations and programs throughout the city. As the second longest-running LGBTQ film festival in the world, Reeling has established itself as a groundbreaking event, featuring diverse films and invaluable events. This year&apos;s festival will screen approximately 100 independent films, as well as special events, industry panels and seminars. Eat, drink and be merry at the nation&apos;s leading culinary experience, where chefs, master sommeliers and wine, spirit and beer-makers show off their skills and wares in a series of live cooking demonstrations, interactive wine and cocktail seminars, and — of course — plenty of tastings. Expect a star-studded lineup of celebrity chefs, including the likes of Rick Bayless and Stephanie Izard. For one weekend, residents in the historic Pullman neighborhood open their doors to the public for this annual tour, where attendees can peek beyond the beautiful facades to see inside grand mansions, workers&apos; cottages and unique apartment buildings. A must for movie lovers, this annual festival screens more than 150 works from more than 60 countries, from narrative features and documentaries to short films. 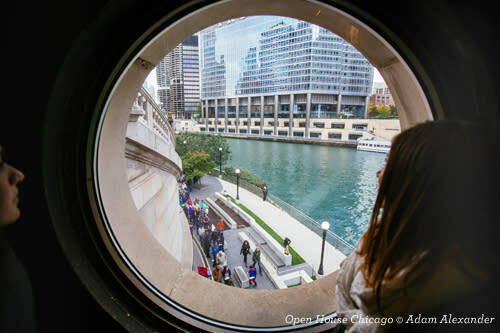 For 48 hours, go behind-the-scenes of 200 buildings across Chicago — from hidden gems to architectural icons — in this free public festival presented by the Chicago Architecture Center. Get inspired at this empowering experience, where entertaining and accessible events, grassroots initiatives and fascinating content presented by innovative speakers (think A-list actors, eminent entrepreneurs, tech moguls and politicians) move attendees to action. Many events cost only $15 per ticket, making it an affordable and accessible experience for community members. Harnessing the imagination of Chicago&apos;s creative community, artists from world-renowned institutions will combine forces to produce an over-the-top Halloween parade featuring large-scale creations, costumed performers, and music and dance as it moves north from Balbo to Monroe in a spectacular procession. View sculptural objects, functional art and design at this annual gallery-presented art fair, where approximately 35,000 attendees peruse the wares of 80 dealers. This artistic gathering also offers a lecture series and special events examining the artwork on display.